When I finally completed my doctoral dissertation, after many long delays, my parents and sisters celebrated the occasion by giving me a handsomely framed print of Der Bücherwurm , painted by Karl Spitzweg in 1850. I think they were greatly relieved that I finished the degree before I came to look exactly like this! Laura even gave me a Der Bücherwurm tie. The print hangs in my office, and I often wear the tie when I need to look “curatorial” at special events. Now I am on my way to being more like him, it seems, because as of July 1, 2010, I have tenure. It’s been a long time coming, given that my years at OBU were not counted, and my first several years at OU were not tenure-track. But someone didn’t get the memo, and on Thursday of this past week my position became that of a tenured associate professor. Spitzweg’s painting pokes gentle fun at a scholar with his nose pressed so closely into the printed page that he has forgotten the world around him. 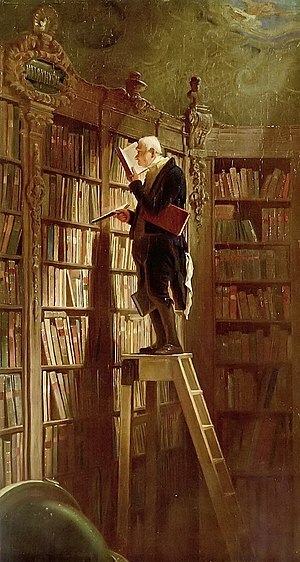 Oblivious, he perches high on the ladder in the Metaphysik section of the library, clutching four books at once, scarcely realizing what a precarious position he is in, much less that he is about to lose his handkerchief. These books look much like the ones I work with practically every day. A few years ago I had the delight of visiting an old library somewhat like this one, at the Strahov monastery in Prague. Although I was able to spend some time in Bavaria two years ago, I have not yet seen Spitzweg’s original painting, which is held by the Museum Georg Schäfer in Schweinfurt, Germany. Mother, Dad, Julie, Laura: thanks so much for this print, and tie, and for believing in me when the ladder seemed far too tall to climb. Now that I’m here, I’ll do my best to share these treasures with the world around me. This entry was posted in Family and tagged Libraries. Bookmark the permalink. I love it!! That has always been one of my favorite pictures and it did seem to be an appropriate gift…. with all love!! Congratulations on receiving tenure, Kerry! You deserve it. Thrilled that academia got this one right. Onward!